I must be wayyyy behind the curve on this one, but I found out today from a Women's Wear Daily fashion newspaper (gotta love work) that MAC will be collaborating with Hello Kitty to come out with a makeup collection. I am SO excited! I love makeup, I love hello kitty... What could be better than a cute collection full of pink makeup!?!? The collection will be coming out February 12, 2009 in stores and February 10 online for the US market. 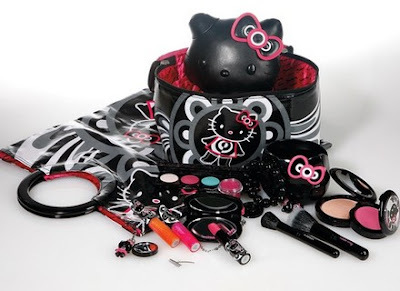 There are two collections with the theme including a low-end Hello Kitty Colour Collection and the high-end Hello Kitty Kouture. As cute as it is I don't think I'll be buying the $35 black vinyl Hello Kitty, but I am definitely wanting to check out the lip glasses ($14) and tinted lip conditioners (14.50). And the pink blush looks pretty gorgeous too. As the group president of Estée Lauder Cos. Inc. John Demsey said, "[Hello Kitty] may not have a mouth, but she’s going to sell a lot of lipstick." More power to her! The waiting list for the collection goes online at maccosmetics.com on Jan. 7th. Will you be in line? 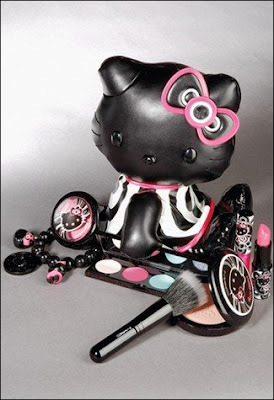 Never been a huge Hello Kitty follower, but MAC + Hello Kitty sounds pretty wicked. This would appeal to the sophisticated kiddy heart, but I'd like to see more McQueen/Ungaro/other haute Couture collaborations. your myspace faker has made her profile private! any word on the picture situation? Rachel: I'm still working on it. I sent in my second sign today. FRUSTRATING!! Oh, and did you notice "mina" now has a back bikini shot as her profile pic? Yeah right. hello kitty and MAC?! OMG!! this sounds interesting!! Hello Kitty has no mouth!! Should she really be selling lip gloss? Haha. Dumb joke, sorry.